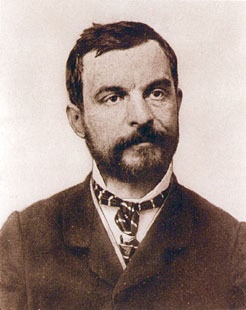 German botanist, born at Leipzig on the 18th of May 1824. He came of a family engaged in trade, and after being educated at the Realschule of Leipzig he entered business as a music-dealer. Much of his botanical work was done while he was so employed, until in 1863 he was nominated, without intermediate academic steps, to the chair in Heidelberg; from there he was transferred in 1872 to Tübingen, in succession to H. von Mohl. His first work was on the distribution of the Coniferae in the Himalaya, but his attention was very soon devoted to studying the sexuality and origin of the embryo of Phanerogams. His contributions on this subject extended from 1847 untill 1860, and they finally settled the question of the origin of the embryo from an ovum, as against the prevalent pollen-tube theory of Matthias Jakob Schleiden, for he showed that the pollen-tube does not itself produce the embryo, but only stimulates the ovum already present in the ovule. He soon turned his attention to the embryology of Bryophytes and Pteridophytes, and gave continuous accounts of the germination of the spores and fertilization in Pilularia, Salvinia, Selaginella. Some of the main facts of the life of ferns and mosses were already known; these, together with his own wider observations, were worked into that great general pronouncement published in 1851 under the title, Vergleichende Untersuchungen der Keimung, Entfaltung and Fruchtbildung höherer Kryptogamen and der Samenbildung der Coniferen. This work will always stand in the first rank of botanical books. It antedated the Origin of Species by eight years, but contained facts and comparisons which could only become intelligible on some theory of descent. The plan of life-story common to them all, involving two alternating generations, was demonstrated for Liverworts, Mosses, Ferns, Equiseta, Rhizocarps, Lycopodiaceae, and even Gymnosperms, with a completeness and certainty which must still surprise those who know the botanical literature of the author's time. The conclusions of Hofmeister remain in their broad outlines unshaken, but rather strengthened by later-acquired details. In the light of the theory of descent the common plan of life-history in plants apparently so diverse as those named acquires a special significance; but it is one of the remarkable features of this great work that the writer himself does not theorize -- with an unerring insight he points out his comparisons and states his homologies, but does not indulge in explanatory surmises. It is the typical work of an heroic age of plant-morphology. From 1857 until 1862 Hofmeister wrote occasionally on physiological subjects, such as the ascent of sap, and curvatures of growing parts, but it was in morphology that he found his natural sphere. In 1861, in conjunction with other botanists, a plan was drawn up of a handbook of physiological botany, of which Hofmeister was to be editor. Though the original scheme was never completed, the editor himself contributed two notable parts, Die Lehre von der Pflanzenzelle (1867) and Allgemeine Morphologie der Gewächse (1868). The former gives an excellent summary of the structure and relations of the vegetable cell as then known, but it did not greatly modify current views. The latter was notable for its refutation of the spiral theory of leaf arrangement in plants, founded by C. F. Schimper and A. Braun. Hofmeister transferred the discussion from the mere study of mature form to the observation of the development of the parts, and substituted for the "spiral tendency" a mechanical theory based upon the observed fact that new branchings appear over the widest gaps which exist between next older branchings of like nature.